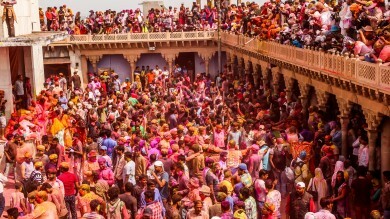 Customize your trip with a local travel expert in India. A tiger safari in India is a once-in-a-lifetime opportunity to experience the power and grace of India’s most treasured animal. 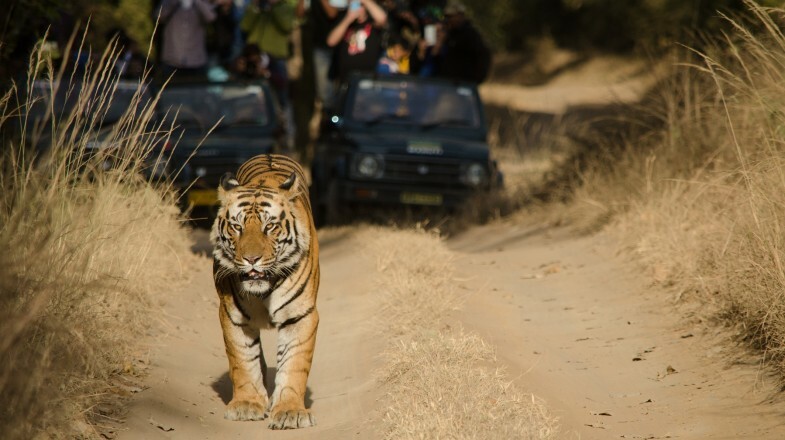 Under a conservation program titled Project Tiger launched by the Indian Government in 1972, 47 Project Tiger Reserves were established, making this country undoubtedly one of the best in the world when it comes to tiger safaris. 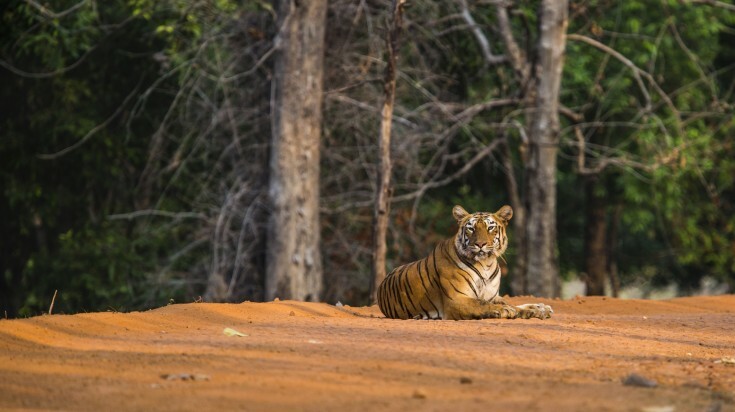 All of the National Parks listed below have tiger reserves founded by Project Tiger in addition to housing some of the largest tiger populations in India. 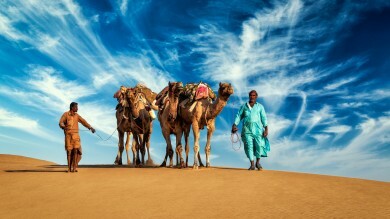 Not only that, there are plenty of other wild and wonderful creatures, flora, and striking landscapes all of which make India a desirable travel destination. If you’re a wildlife enthusiast or animal lover, don’t miss the chance at safari in India! Declared a national park in 1968, Bandhavgarh is noteworthy for its 1,300 plus species of endemic plants, but that’s definitely not the main attraction. This park is said to have the highest concentration of tigers in the country, making it one of the most popular places for a jungle safari in India. It also has the largest population of Bengal tigers in the world. Unique to this park are the White tigers, which were first discovered in this region. It is said that you’d have to be very unlucky to not see a tiger here! Best time to visit: The park is open year-round; however, the different seasons offer different experiences. The hottest summer months between March – May see temperatures of 40° C, but this is the best time to spot wildlife as all the animals come out in search of water. The most popular months are between November – February (winter) because tourists can avoid the intense heat as well as see the nature and vegetation rejuvenated from the monsoon season (June through October). How to get there: The nearest airport is Khajuraho, but the park entrance is still around 8-hour drive away. The nearest train station (Umaria) is between 30 – 40 minutes away from the park, making an overnight train from Delhi a popular choice. Good to know: The park is divided into three main zones; Tala, Magdhi, and Khitauli. Tala is the zone with the highest density of tigers. This park is one of the biggest and best in northern India. The former-royal hunting ground just 130 kilometers from Jaipur is now a protected area of nearly 400 square kilometers. Interestingly, this park doubles as a famous heritage site due to the ancient ruins scattered within its bounds. The landscape and the diverse range of flora and fauna make this park an excellent home for Bengal and Indian tigers. All the tigers in this park have names, a unique story, and a distinct personality. Visitors always leave here having bonded with at least one or having a “favorite.” From the friendly toothless giant, “Machali”, to the flirty “Romeo”, tourists will have the chance to learn how these tigers earned their names. Best time to visit: 1st October – 30th June. The park is closed to visitors starting 1st July – 30th September. Avoid the heat and visit in winter (October – February) when the park will be in bloom from the heavy rains in monsoon season. Or increase your chances of spotting wildlife in the hotter months of March – May. It’s recommended not to go in June as temperatures will be extremely high. How to get there: The easiest way is to take the train from Jaipur, Delhi or Bombay to Sawai Madhopur Railway Station. Sanganer Airport (in Jaipur) is the nearest airport. From the former destination, the park is 30 mins away on a taxi. From the latter, the journey is 3-hour on a taxi or a bus. Good to know: The park has 10 different zones, of which zones 1 – 5 are excellent for tiger spotting. Find the zone breakdown details here. You know a park that inspired the Jungle Book has got to have one of the best jungle safaris in India. Kanha National Park is also considered one of the best maintained parks in all of Asia thanks to its heavy emphasis on protection and preservation. Most notably, this park single-handedly saved the Swamp Deer from near extinction. The nearly 2,000 square kilometers of sweeping meadows and forests also claim the renowned Kahna Tiger Reserve, created in 1974. 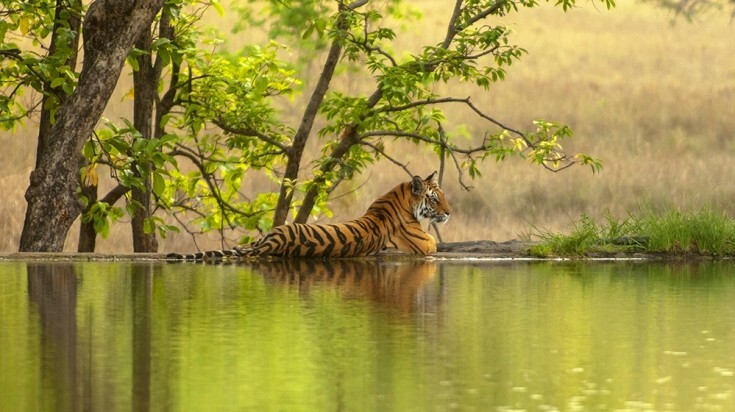 They boast the highest number of tiger sightings in the wild than any other park in India. If these weren’t enough reasons to get to Kahna National Park, there’s the breathtaking sunset view from Bamni Dakar (Sunset Point) that visitors swoon over. Best time to visit: If you don’t mind the heat, book a safari between March – May. Those who want to stay cool are better of visiting in the winter seasons of November – February. The park is closed from 1st July – mid-October. How to get there: The nearest airport is Jabalpur, roughly 3.5 hours or 160 kilometers away. Direct flights from Mumbai and New Delhi are available to Jabalpur. The park is also reachable by train. The two nearest stations are Jabalpur (a 3-hour drive from the park’s entrance) and Gondia, (4-hours away). Good to know: Part of BBC’s “Wonder of the Monsoons” series was filmed in Kanha National Park. Located in the absolute center of the country, this park is naturally divided into an eastern part and western part by the Pench River. It’s been a national park since 1975 and a tiger reserve was formed later in 1992. Known for its flora, fauna, and healthy population of Bengal tigers, this park is also famous for river rafting. Pench National Park is said to have joined forces with Kanha National Park to influence Rudyard Kipling’s “Jungle Book.” Unique to this park are the 10 villages either located within its bounds or on its periphery. 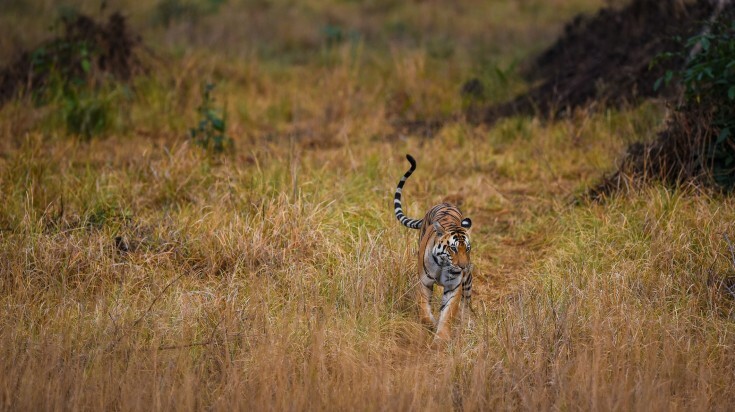 Pench is an excellent option for a tiger safari in India as tiger sightings are said to happen every day! Best time to visit: February through June are the best months for animal spotting as the Indian summer heat drives animals out to find water. However, temperatures can reach 45° C in this park, making it unbearable for visitors. The cooler winter season of October – February is the best in terms of mild temperatures (11° – 31° C). The monsoon season (July – September) brings a lot of rain, but the park’s vegetation is at its most naturally beautiful at this time. How to get there: Dr. Babasaheb Ambedkar Nagpur International Airport (NAG) in Sonegaon, Nagpur is the closest airport at 92 kilometers away and is served by direct flights from Delhi and Mumbai. Nagpur Railway Station is also 92 kilometers away and is connected to Delhi, Mumbai, and other major cities. The drive from both the airport and train station to the park’s entrance is roughly 2 hours. Good to know: Tourism boomed after 2008 when a well-received documentary, “Spy in the Jungle” was filmed in Pench. The 3-part series aired on BBC and was narrated by David Attenborough. The film used secretly placed cameras to document the tigers’ behaviors. The oldest national park in India, established in 1936, was also the first park to participate in Project Tiger. Because of its location in northern India, the climate and environment are slightly different from the other parks on this list. It’s composed of dense forests, marshlands, grasslands, rolling hills, and the large Ramganga Reservoir. Wildlife buffs will love this park for its high density of fascinating animals including tigers, crocodiles, and otters. Best time to visit: The winter and summer months of November – May, depending on your preference for wildlife viewing and your tolerance for very hot temperatures. The park is closed from 1st July – 14th November. How to get there: The Ramnagar Railway Station is just 15 kilometers from the park and is served by trains from Delhi, Moradabad, Bareilly, and other major cities. Good to know: The park was named after a famous hunter, wildlife conservationist, and naturalist, Jim Corbett, because of his efforts in influencing the government to establish the park. This park is roughly 524 square meters but soars to 1,427 square meters when the two neighboring sanctuaries and Satpura Tiger Reserve are included. This park claims it’s better than all the rest if your goal is to escape the crowds and the hustle of tourist-y jeep safaris. Discover the hundreds of different wildlife species and beautiful landscapes by boat, jeep, or elephant safari tours. 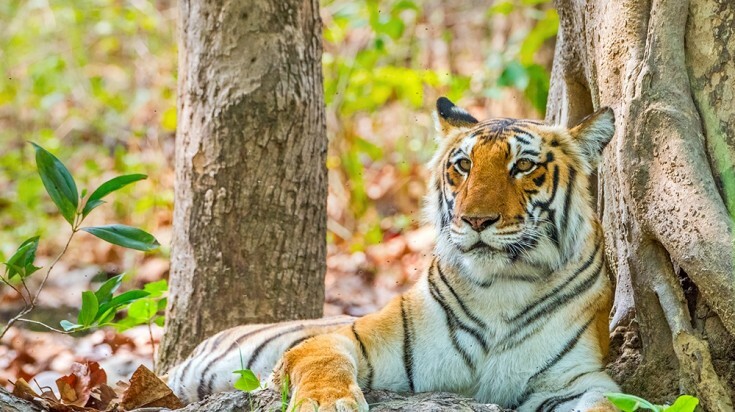 This park is known as a great tiger spotting reserve, but it also has many other worthy animals to see such as antelope, flying squirrels, porcupines, crocodiles, and peacocks — just to name a few. Best time to visit: The winter and early summer months of October – April due to temperate weather and plentiful animal sightings. The park is closed 16th June – 30th September. How to get there: The nearest airport is in Bhopal city which is 200 kilometers away from the park. There are four railway stations with park accessibility; Itarsi, Sohagpur, Pipariya, and Hoshangabad. All these stations are within 70 kilometers or less from the park. Itarsi is the largest station and best connected to many major cities throughout India. Sohagpur is the closest at just 20 kilometers away, but doesn’t serve as many long-distance trains as the other stations. The station you use will depend on your origin. Dense woodlands, diverse flora and fauna, and an impressive number of Bengal tigers define one of the oldest and largest national parks in India. The park’s territory and tiger reserve amount to 1,727 square kilometers and is home to roughly 43 tigers. In addition to seeing these regal animals, sloth bears, wild dogs, leopards, honey badgers, and more can also been seen here. The highlight at this park is definitely the open-top jeep safaris. Best time to visit: The park is open from 15th October to 30th June and closed between 1st July – 14th October. The best time to visit is in March and April. These months are before the unbearably high summer temperatures, but usually have hot enough weather to ensure good tiger-spotting opportunities. How to get there: The park is roughly 140 kilometers away from the closest airport, Dr. Babasaheb Ambedkar Nagpur International Airport in Nagpur. Regular flights can be found from Mumbai, Delhi, Kolkata, Bengaluru, and Chennai. From the airport, a hired taxi is the best way to get to the park’s entrance. The nearest bus and railway station is Chandrapur, 45 kilometers away. Good to know: Even during the open season the park is closed all day every Tuesday. Tourists have a very high chance of spotting tigers if they visit any one of these six parks. There are many factors that combine to make them the top choices for a tiger safari in India; all are part of Project Tiger, take great pains to keep their precious tigers healthy and protected, and work tirelessly to ensure the tigers’ natural environment. A multi-day tour in any of the above national parks in India is an unforgettable and touching experience.